The Aru Islands Regency (Indonesian: Kabupaten Kepulauan Aru) are a group of about ninety-five low-lying islands in the Maluku province of eastern Indonesia. They also form a regency of Maluku, with a land area of 8,152.42 square kilometres (3,147.67 square miles). At the 2011 Census the Regency had a population of 84,138; the latest official estimate (as of January 2014) was 93,722. The regency is divided into seven districts (kecamatan), tabulated below with their areas (in km2) and their 2010 Census populations. The islands are the easternmost in Maluku province, and are located in the Arafura Sea southwest of New Guinea and north of Australia. The total area of the islands is 8,152.42 km2 (3,147 sq mi). The largest island is Tanahbesar (also called Wokam); Dobo, the chief port of the islands, is on Wamar, just off Tanahbesar. Other main islands are Kola, Kobroor, Maikoor, and Trangan. The main islands rise to low hills, and are separated by meandering channels. Geologically, the group is part of the Australian continent, along with New Guinea, Tanimbar, Tasmania, Waigeo, and Raja Ampat on the Indo-Australian Plate. Aru is covered by a mix of tropical moist broadleaf forests, savanna, and mangroves. 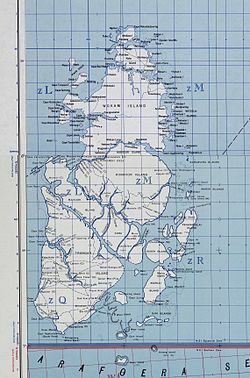 The Islands lie on the Australia-New Guinea continental shelf, and were connected to Australia and New Guinea by land when sea levels were lower during the ice ages. The flora and fauna of Aru are part of the Australasia ecozone, and closely related to that of New Guinea. Aru is part, together with much of western New Guinea, of the Vogelkop-Aru lowland rain forests terrestrial ecoregion. As part of the political and administrative decentralization of Indonesia since Suharto stepped down in 1998, the Aru Islands are now a separate residency (kabupaten), headquartered at Dobo, split off from the residency of Central Maluku. Pearl farming provides a major source of income for the islands. The Aru pearl industry has been criticized in national media for allegedly maintaining exploitive debt structures that bind the local men who dive for pearls to outside boat owners and traders in an unequal relationship. Other export products include sago, coconuts, tobacco, mother of pearl, trepang (an edible sea cucumber, which is dried and cured), tortoiseshell, and bird-of-paradise plumes. In November 2011, the Government of Indonesia awarded two oil-and-gas production-sharing contracts (PSC) about two hundred kilometres (124 mi) west of the Aru Islands to BP. The two adjacent offshore exploration PSCs, West Aru I and II, cover an area of about 16,400 square kilometres (6,300 square miles) with water depths ranging from 200 to 2,500 metres (660 to 8,200 feet). BP plans to acquire seismic data over the two blocks. The Aru Islands have a long history as a part of extensive trading networks throughout what is now eastern Indonesia. Precolonial links were especially strong to the Banda Islands, and Bugis and Makasarese traders also visited regularly. The islands were sighted and also possibly visited by some Portuguese navigators, such as Martim Afonso de Melo, in 1522-24, who sighted the islands and wintered on a nearby island or of the Aru archipelago itself, and possibly by Gomes de Sequeira, in 1526, as is pointed out in the cartography of the time. The Spanish navigator Álvaro de Saavedra sighted the islands on 12 June 1528, when trying to return from Tidore to New Spain. The islands were colonized by the Dutch beginning 1623, though initially the Dutch East India Company was one of several trading groups in the area, with limited influence over the islands' internal affairs. In 1857 the famous naturalist Alfred Russel Wallace visited the islands. His visit later made him realise, that the Aru islands must have been connected by a landbridge to mainland New Guinea during the ice age. In the nineteenth century, Dobo, Aru's largest town, temporarily became an important regional trading center, serving as a meeting point for Dutch, Makasarese, Chinese, and other traders. The period from the 1880s to 1917 saw a backlash against this outside influence, by a spiritually-based movement among local residents to rid the islands of outsiders. Inhabitants of the eastern coast of the Aru Islands, photographed late 1899 during the Siboga Expedition. The islands had a population of 84,138 at the 2010 Census. Most indigenous islanders are of mixed Malay and Papuan descent. Fourteen languages - Barakai, Batuley, Dobel, Karey, Koba, Kola, Kompane, Lola, Lorang, Manombai, Mariri, East Tarangan, West Tarangan, and Ujir - are indigenous to Aru. They belong to the Central Malayo-Polynesian languages, and are related to the other languages of Maluku, Nusa Tenggara, and Timor. Ambonese Malay is also spoken on Wamar. All are members of the Austronesian language family. The population is mostly Christian with a small Muslim minority. Figures cited by Glenn Dolcemascolo for 1993 were approximately 90% Protestant, 6% Catholic, and 4% Muslim. A more recent report from 2007 suggested that the 4% Muslim figure may only relate to the indigenous population and that the actual percentage of Muslims may be significantly higher. Islam is thought to have been introduced to the islands in the late 15th century. The Dutch brought Christianity in the 17th and 18th centuries but much of the conversion of the population to Christianity did not take place until the 20th century. ^ "Indonesia: Government Awards Two Offshore PSCs to BP". Offshore Energy Today. 21 November 2011. ^ "BP clinches key Indonesian deals". The Scotsman. 22 November 2011. ^ Dolcemascolo, Glenn (1996). "Foreign Encounters In an Aruese Landscape". Cakalele. The Center for Southeast Asian Studies. 7: 79–92. ISSN 1053-2285. S. O’Connor, M. Spriggs and P. Veth, ed. (2007). Terra Australis 22 - The Archaeology of the Aru Islands, Eastern Indonesia. ANU E Press. ISBN 978-1-921313-04-2. 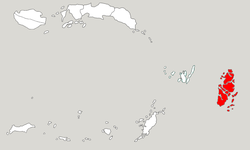 Wikimedia Commons has media related to Aru Islands Regency.